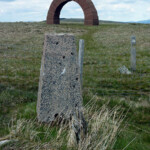 This stretch includes the highest hills of the entire Southern Upland Way, but there’s far more to it than that. 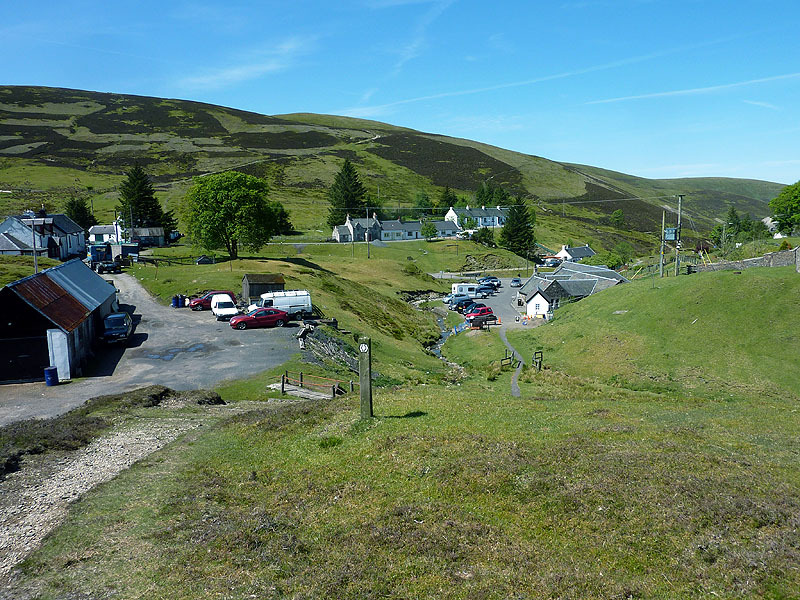 There’s the long, steady descent into Nithsdale to be enjoyed, and the upland village of Wanlockhead with its mining heritage, with occasional bits of forestry, all linked by paths that are mostly excellent underfoot. 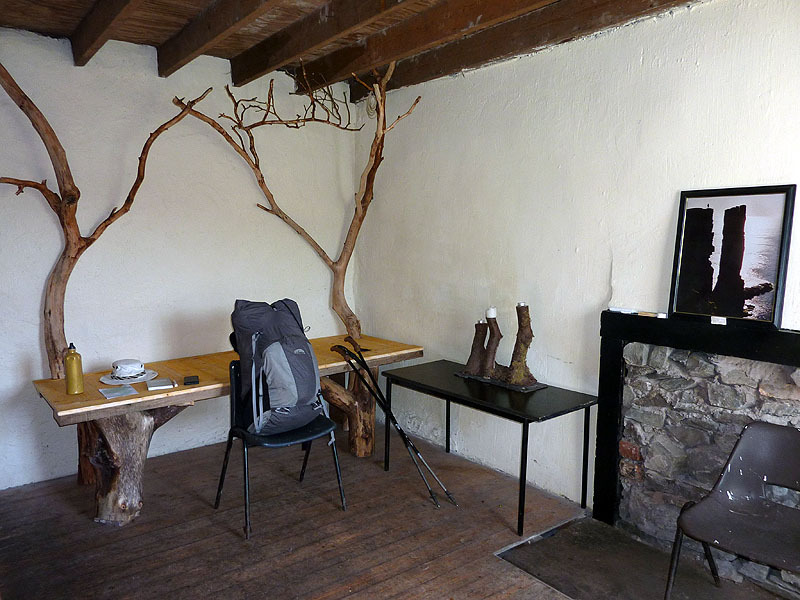 And at the end, two of the best bothies I have ever stayed in. Monday 8 June 2015. 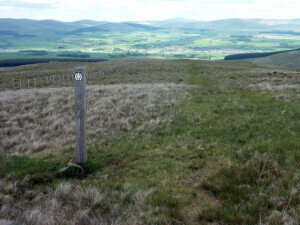 St John’s Town of Dalry to Polskeoch bothy, 17 miles. 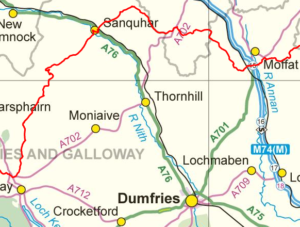 The first half day out of Dalry takes you more or less due north, a direction barely touched so far. Rounding Ardoch Hill early on, there’s one of those places where the OS map has decided the Way takes a slightly different line – down by the burn – to that signposted. Slowly, height is gained despite a couple of valley dips, to the community of Stroanpatrick. It didn’t feel too friendly around here, with a couple at a farmhouse studiously avoiding my wave and plenty of electric fences to be wary of. It’s one of the pick-up points for the Clachan shuttle however. 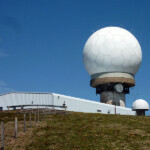 North-east now, things get better over Manquhill Hill, with the even higher ground of Benbrack (1902ft, highest yet) and its satellites in view. 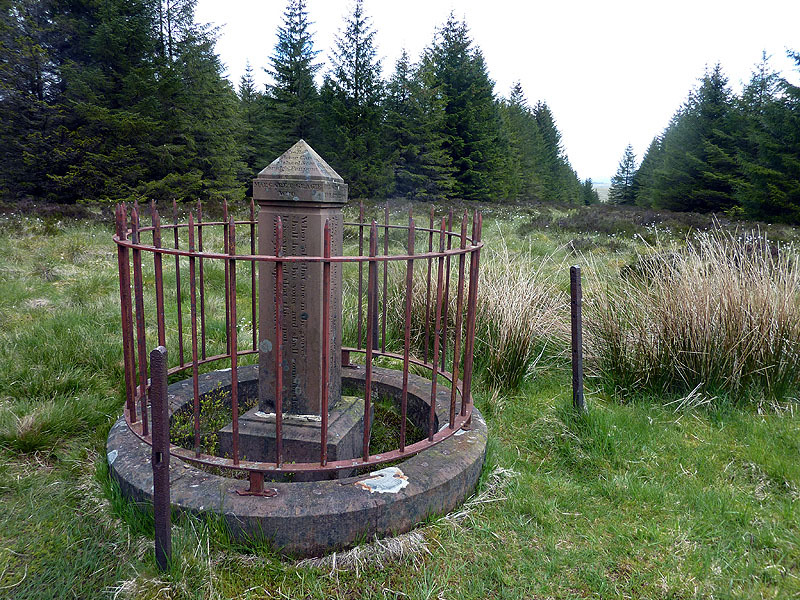 It’s a stiff old pull up to the top of Benbrack, and it felt positively crowded – there seemed to be a figure ahead of me, and later, two behind. 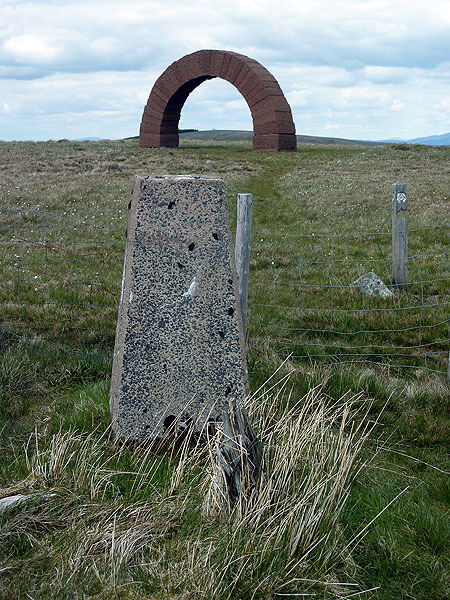 Benbrack has not just a trig point but one of the four sandstone striding arches created in 2002 by sculptor Andy Goldsworthy. Another, on Colt Hill across the valley, is in clear view but like the other two not visited by the SUW. Their circuit would be an interesting walk in its own right and perhaps the two walkers behind had that in mind; they did not overtake me. It was on the ascent of the next top, Cairn Hill, that I caught up with the solo walker, resting at a dip. Initially I was a bit concerned for him, as he’d not even taken off his sac. He had his GPS out and clearly needed both a rest and a bit of help with navigation – I assured him he was in the right place before continuing on. He turned out to be Alan, a 72 year-old with a formidable history including Corsica’s GR20, arguably the hardest trail in Europe. 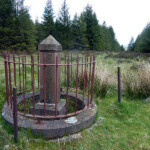 After Cairn Hill there’s one more top, Black Hill – it’s a tad confusing, and despite signposts it would be possible to go wrong here – before the Way plunges into forest, seeking out Allan’s Cairn, a memorial to martyrs of the area’s seventeenth century ‘killing times’ of religious strife. Downhill to Polskeoch bothy, now; but not before an interesting obstacle course in the forest, fallen trees having blocked the path and causing a few minutes’ thought before finding ways round. 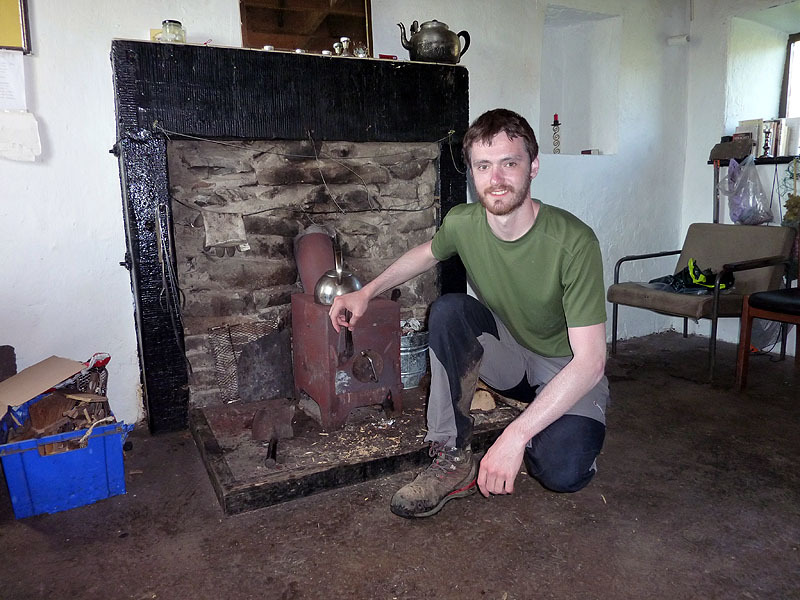 Two other walkers, Josh and Kilian, were at the bothy when I arrived. I recognised their names (and Alan’s) from the bothy book at White Laggan. If Alan and I were the senior citizens, Josh and Kilian represented the future, both in their early twenties. Josh was testing himself for the GR20 with 25kg pack, while Kilian had come over from Germany for the trail. Alas, he was badly blistered and tomorrow would go only to Sanquhar before abandoning. Alan eventually made his way down, despite a meander, and we talked well into the night, well 9pm. 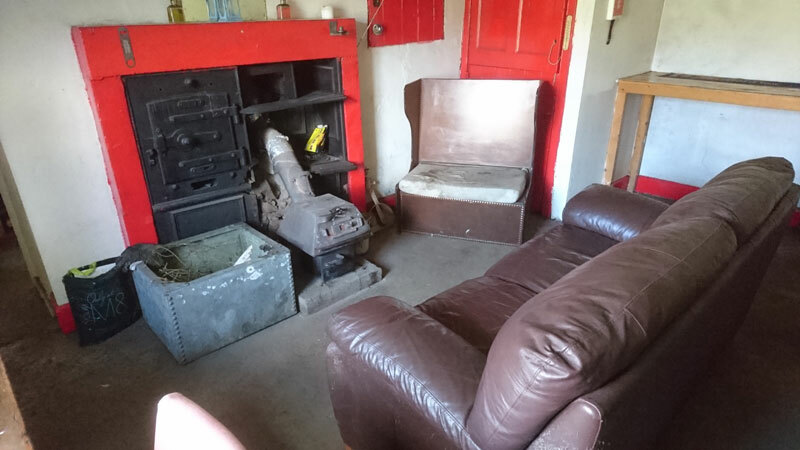 The bothy had suffered from vandalism and wasn’t the bothy Hilton promised in the guidebook; as the others all planned to be away at 7ish, and I didn’t, I volunteered to pitch outside so as not to be disturbed early. Tuesday 9 June 2015. 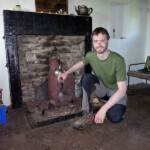 Polskeoch bothy to Wanlockhead, 17 miles. 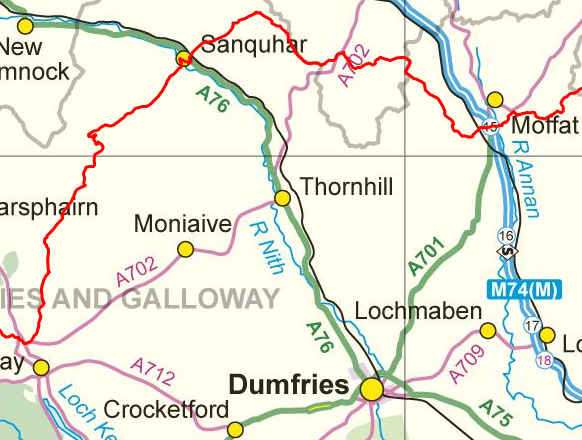 In all my planning, I’d decided to have a short day today, just to Sanquhar, and give myself a 21-mile 5,000ft epic for Wednesday. 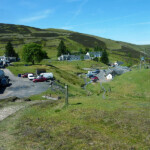 Then just before I left home I tinkered with the idea of making the two days more even by splitting at Wanlockhead. I’m sure it was a sensible decision. Sensible not least because Polskeoch to Sanquhar would have been a very short half-day indeed. There are a few road miles before branching off onto Cloud Hill, not a tricky climb – though I caught up Alan again, still checking his GPS! 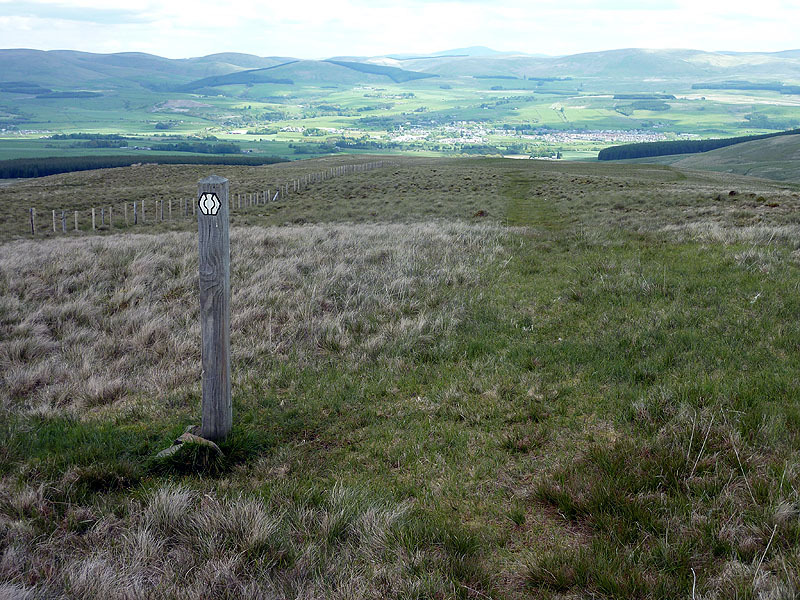 – and the descent into Sanquhar is a glory, just the right amount of steepness to encourage the legs without having to over-engage brain, and few boggy bits to hop or circle. With Nithsdale below, the broadest valley of the Way so far, and sun all around, this section was a joy right to the farmland on Sanquhar’s outskirts. 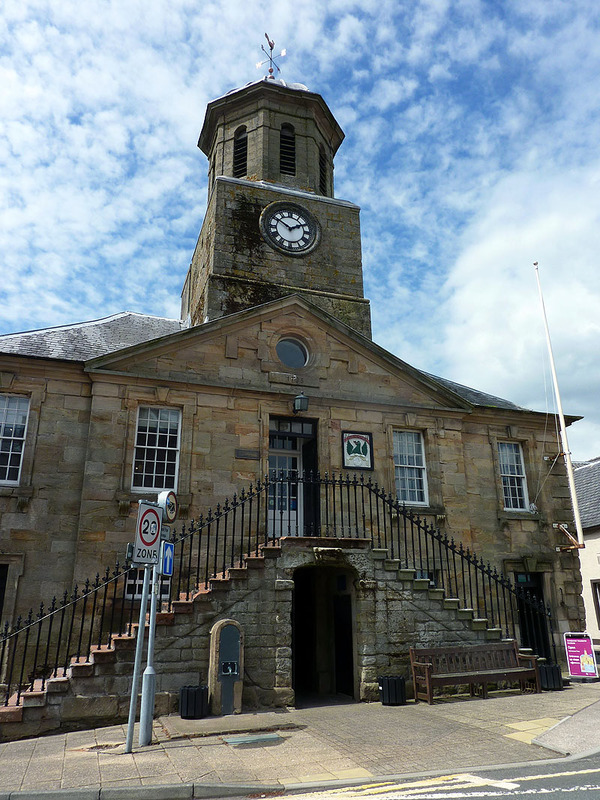 There was a slight sting in the tail, when the guidebook said that the long way in via Sanquhar Castle had been replaced by a quarter-mile down a lane only to find it hadn’t, but there was plenty of time to sit in the town’s arts centre coffee shop for a bit to eat and some orange juice. The afternoon was different in character, a triplet of rise followed by descent, each a little harder than the one before. It was on the last, climbing away from Cogshead Burn, that I caught up with Josh again, and the time passed quickly together as we spent the rest of the journey talking. That said, we were both taken somewhat aback by the scale of industrial devastation around Wanlockhead, most clearly seen by the tracks scoured onto Sowen Dod but present too in abandoned spoil heaps and derelict machinery. 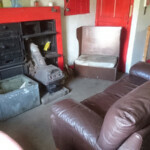 As the village (which is just over the border in south Lanarkshire) has neared, all this has been tidied up in the name of heritage and the Lead Mining Museum, and as the village has few amenities these days this is no bad thing. But it does still have a pub; Josh and I pitched our tents in its grounds, and enjoyed a good chat with the landlord all the way through to, ooh it must have been nine o’clock. Wednesday 10 June 2015. 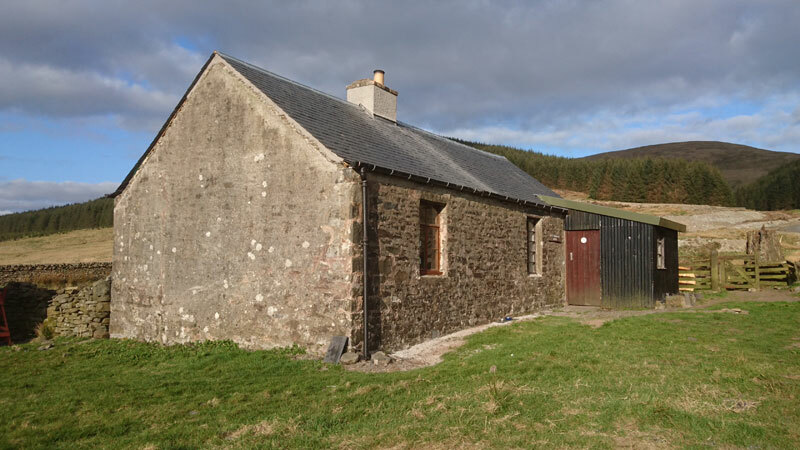 Wanlockhead to Brattleburn bothy, 14 miles. Time to start winding down the distance. 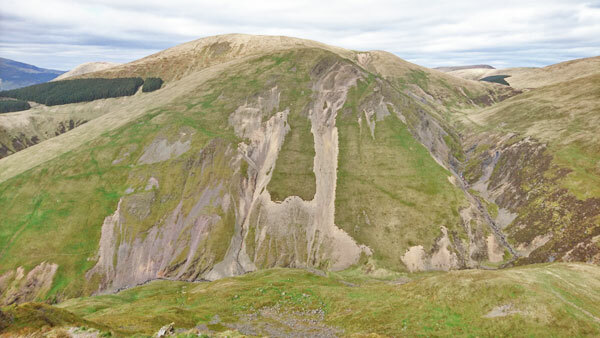 But maybe not the height gain; Lowther Hill, at 2378ft, is the highest ground on the SUW, although any severity is tempered by the 1500ft start afforded by Wanlockhead (the highest village in Scotland) itself. There was just one logistical hiccup to solve, and that was not having any breakfast left and the pub not doing breakfast – a relic of earlier planning, I presumed, when I knew I would be able to get hold of something, probably with bacon and eggs in it, in Sanquhar. There was little choice therefore to wait for the museum tea shop to open at 11. Very worth it too, and filled with baps, toast, banana and tea Lowther Hill felt barely like a hill at all. Another top, Cold Moss, follows, but strangely it was the next and lowest hill, Laght Hill, that felt the toughest; I knew the Way didn’t cross its top, and subconsciously I might have been expecting to contour round earlier than the path allows. It’s a bit of a scruffy descent from here to the A702, the busiest road since Castle Kennedy and carrying all of two vehicles a minute. I took a bit of time out at Potrail Water, scooping up the stream in my Tilley hat and drenching my head and top – a favourite pastime on hot days like this. I’d marked this spot as a possible wild camp had I not coped with the 21-miler I’d originally planned, though with all manner of flying insects around I was glad the need didn’t arise. From here, another causeway path led through forest to a gravel track, and hence to the Daer Reservoir – here, the guidebook was correct in showing the route over the dam itself rather than the road to the north. On the ascent of Hods Hill I was surprised to see Josh ahead of me, as he must have had well over two hours’ start; I caught him up in the forest, to hear that he was suffering from achilles trouble, which I’ve had myself so could sympathise. We stayed together through the forest to Brattleburn bothy. What a find this is! 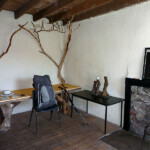 As pleasant a surprise as Polskeoch was a disappointment, with two rooms and an attic, plenty of wood for the fire, ornaments, pans and doggerel. No loo though, that would have spoilt it. 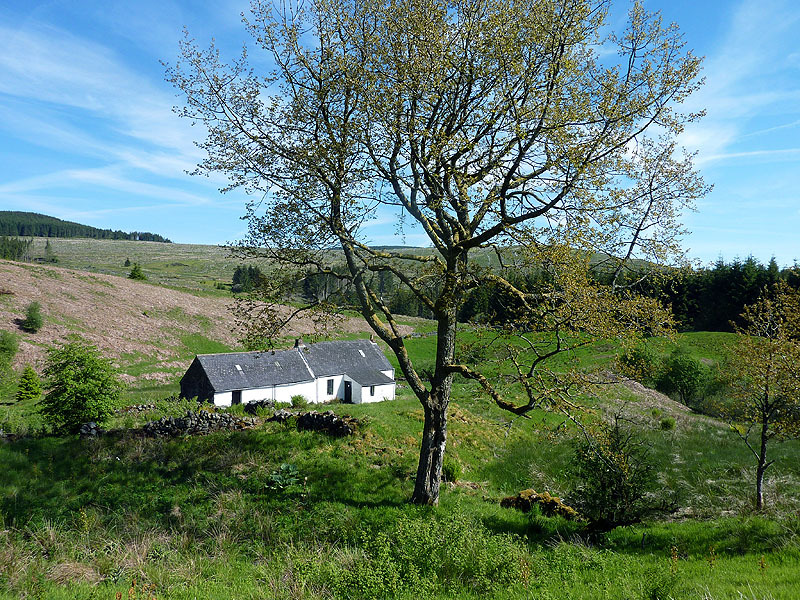 The picture opposite made the 2016 Mountain Bothies Association calendar, by the way. Thursday 11 June 2015. 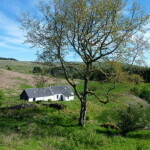 Brattleburn bothy to Beattock, six miles. As he was expecting to make slow going with his achilles, Josh started early, while I adjusted my timetable to suit the buses south from Beattock. It nearly didn’t work out, for no sooner had I put my boots on than I realised I had some foot trouble too, on my sole, so walking wasn’t a whole lot of comfort for me either. Still, nothing to do but get on with it. 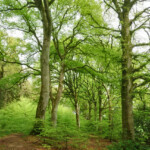 Most of the Way stays in forestry, with a little climb over Craig Hill to start, with a few more fallen trees to circumnavigate, just a single bit of boggy pasture across Garpol Water as variation. 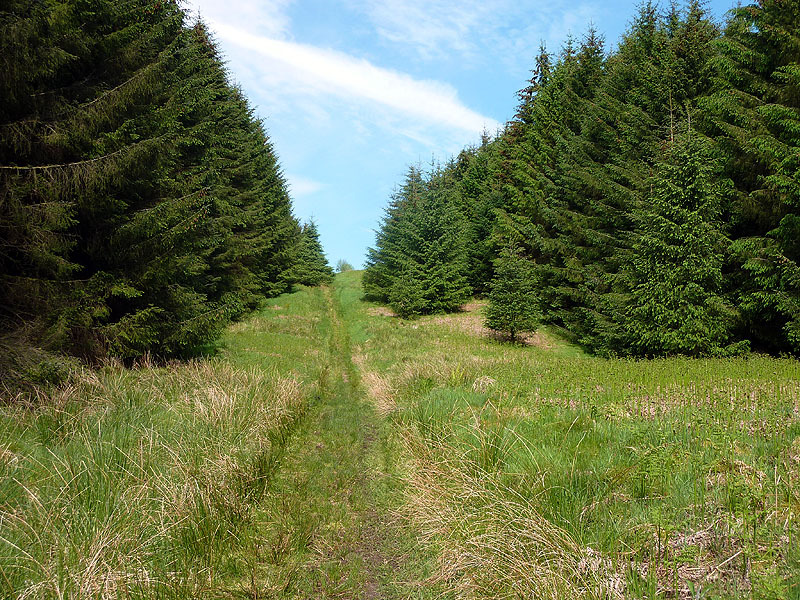 Eventually, past a picnic area, the forest ends at Easter Earshaig, and only two downhill miles remain. Barely thirty minutes at the bus stop by the Old Stables hotel; mental note made in case I needed a room the next year. Friday 13 May 2016. Beattock to Over Phawhope bothy, 10 miles. But instead of an overnight in Beattock I decided on an early start from London. Despite a panic with a delayed train out of Carlisle, I made my connections and was ready to start mid-afternoon. 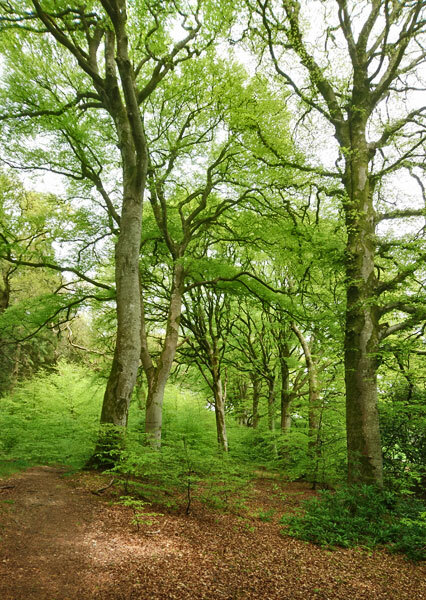 The first few miles are uneventful, save for the very pretty Dumcrieff woods, the beech trees looking splendid in the occasional sunshine. 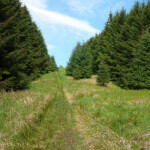 Away from the valley soon after, there’s a climb up into forestry plantations, and soon a choice of routes. One stays lower, on the wide, gravelled forestry tracks of which I had already seen far too much the year before. 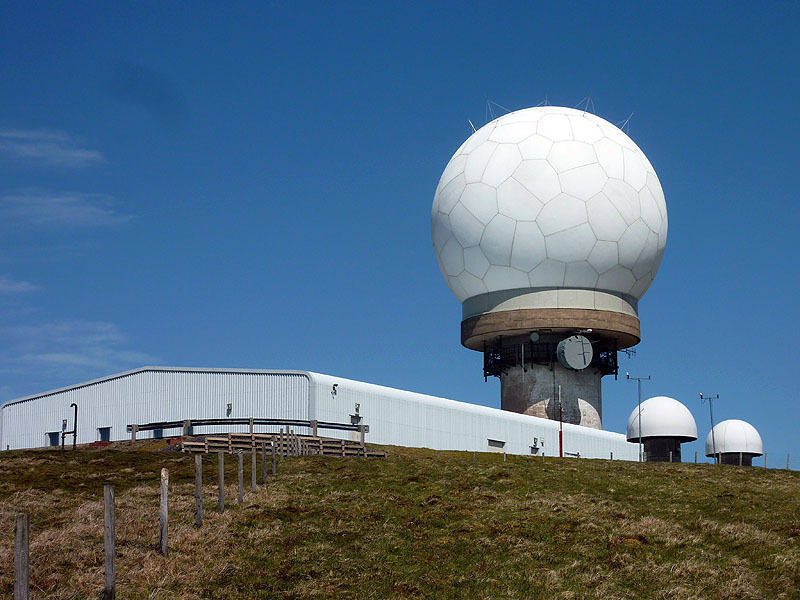 The other went higher, up to the Graham (2000ft hill in Scotland) of Croft Head – though my guidebook noted that in 2012 this was ‘closed’. As I stood at the junction point, pondering my options, a hillwalker comes in from the latter, as if right on cue. He’d been on some of the local hills, Croft Head included, and so not only could he confirm that the route was very much open, he could give me chapter and verse on what to look for. Which, first of all, was cleared forest, before a combination of forest tracks and paths took me to the edge of open country. It’s a nice little ridge to Croft Head, looking forward to the Ettrick Hills. From the top an engineered path zig-zags down to the Selcoth Burn; viewed from here, the track iss no thing of beauty, but saves humans from creating a perhaps more unsightly, and dangerous, scar down the side of the hill as individuals tackle the steep slope. The southern slopes of Capel Fell, just across the burn, show that nature is quite capable of creating her own erosion hereabouts. Not far from the watershed of Ettrick Head a sign at a stile proclaims the entry to The Borders, the second of the two contemporary local government units that the Way passes through. 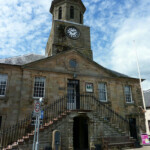 Once though it was Selkirkshire, and it is that which will define the next page of this website. Over Phawhope bothy is just over a mile beyond the boundary.